Is it possible to develop an instrument that does for ecology of micro-organisms just what Galileo’s telescope did for astronomy? This was the question asked by ecologists in the past*. Organisms that live on, in, or near the seabed (called benthic) such as kelp forests, mangroves, seagrass beds and coral reefs are significantly affected by biological activity that occurs at a very small scale. One could also say that they are the forbodes of changes that will be come visible for the human eye on a larger scale on the longer term. For long marine biologist have taken samples of underwater life, e.g. pieces of coral, algae or kelp to the laboratory to study their microstructure. However, the hydrodynamic systems of the sea are continuously changing with high spatial and temporal variations and micro organisms interact with or influence each other in complex ways. 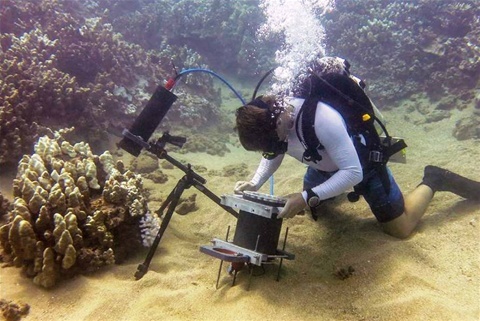 For this reason, Andre Mullen from the Scripps Institution of Oceanography, University of California San Diego searched for a system that made it possible to study these organisms in situ (on the spot), with equipment that permits a microscopic resolution, and that is handled by divers. ** There were three technical challenges to meet in developing such a device. First, microscopic imaging requires a large aperture which results in a shallow depth of field that necessitates precise focusing. Second, non-invasive imaging requires a long working distance and considerations must be made for imaging live organisms with three-dimensional structure. Finally, to perform such work underwater, rapid focusing and exposures must be used due to the unstable environment. BUM (Benthic Underwater Microscope) was the instrument Mullen and colleagues developed and recently tested. BUM is a divers controlled instrument that permits studies of both spatial and temporal processes such as the algal colonization and overgrowth of bleaching corals, as well as coral polyp behaviour and interspecific competition. It uses in application three principle optical components: a long working distance microscope objective lens, a shape-changing Electrically Tunable Lens (ETL) and Focused Light Emitting Diodes (LEDs) providing reflectance illumination. These elements are integrated into a compact imaging system that includes a camera, electronics and user interface. The complete instrument is divided into two housings: the imaging unit containing all optical components, and a control unit containing a computer and a live diver interface (see figure above). Authors believe that insights derived from micro-scale processes in benthic ecosystems may help to understand and model processes that underlie changes in ecosystems on a much larger and slower scale. *Smetacek, V. The ocean’s veil. Nature 419, 565–565 (2002). **Mullen, A. D. et al. Underwater microscopy for in situ studies of benthic ecosystems. Nat. Commun. 7:12093 doi: 10.1038/ncomms12093 (2016).